This El Dorado Hills Social Media Meetup Group is for businesses and people that are interested in social media optimization. The meetup group is not exclusive to El Dorado Hills businesses only. Business owners and social media business marketers in Folsom, Roseville, Rancho Cordova, and Sacramento are all welcome to join us! We will be tackling the basics on keywords for search engine optimization. We will talk about what it means, why you need it for content marketing and will discuss tips on how to research for one. Note that this is very fast-paced and high-level discussion. Come with your question and learn from peers. Question 2: What are keywords? Question 3: How to find keywords? Question 4: How do we use keywords for social media optimization or SMO? The meetup is on January 8, 2015, at 3:00PM-4:30 PM in the Nugget Market cafeteria. This is a hands-on event so please bring your laptop, and also bring a pen and notebook. 3:30-4:00 PM- How to find Keywords for SEO tips. How to join the El Dorado Hills Social Media Meetup Group? Details and RSVP to this social media meetup here. 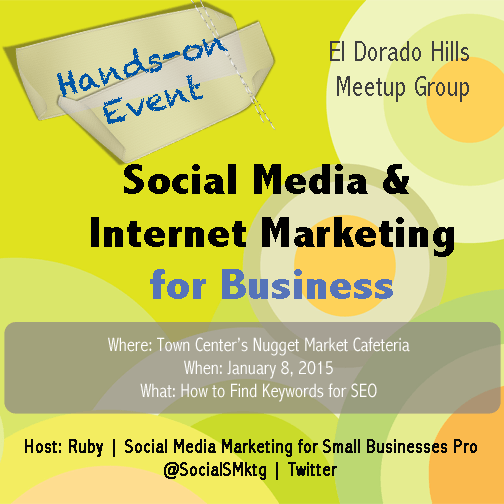 This El Dorado Hills Social Media Meetup Group is hosted by Ruby, a Social Media Marketing Pro for Small Businesses. She is an ethical, experienced and University of San Francisco-certified Advanced Social Media Marketer.